I’ve been well enough to actually go sailing for a few days. It’s not much, but you can expect a real blog post or two soon. In the meantime, a Coromandel has popped up on eBay. Fancy joining the family? Furthermore, if you’d like me to take a look at her with you, I could combine the trip with a visit to the historic dockyard at Chatham. I’m especially interested in the ropery. A comment here is enough for me to get in touch with you by email. Long time readers of my blog will know that I suffer from ME/CFS. It’s kept me away from Tammy Norie (and everything else) over the winter and spring. I won’t bore you with details — this is a boat blog! — but it does mean that I’ve done none of the winter jobs I had panned, and my idea of sailing to South Brittany in the spring will have to wait. I’m on the up, though, and I’m pleased to tell you that Tammy is in good condition. She shipped very little water over seven months, had no internal mould or damp, and generally just needed a tidy-up. This does mean that my Houdini hatch repair worked! Last summer I dug out the leaky seal and replaced it with butyl tape (great stuff!). It’s worked perfectly. But my main innovation this year so far is this. I managed to drop my teapot lid in Fareham Creek while washing it, but retrieved it at low tide. A loop of seizing wire tightened with piers and a lanyard will stop that happening again. This teapot is key equipment! Anyway, I’m pleased to be posting something here to let you all know that both man and boat are afloat. Expect sailing posts soon! Hurricane Ophelia is bringing strong warm winds from the south. If I’m able to get aboard, Tammy will be riding the storm. It’ll probably be down to a F7 by the time it reaches me. He presents evidence that elliptical foils produce more lift than rectangular or triangular, especially at low aspect ratios. (I’m summarizing here.) 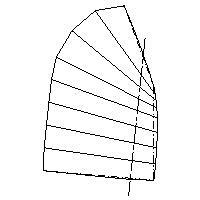 This is rather interesting given my earlier drawing of an enlarged sail for Tammy Norie. I think this evidence gives some clues to why the top triangle on junk rig sails is important: it approximates a curved top. 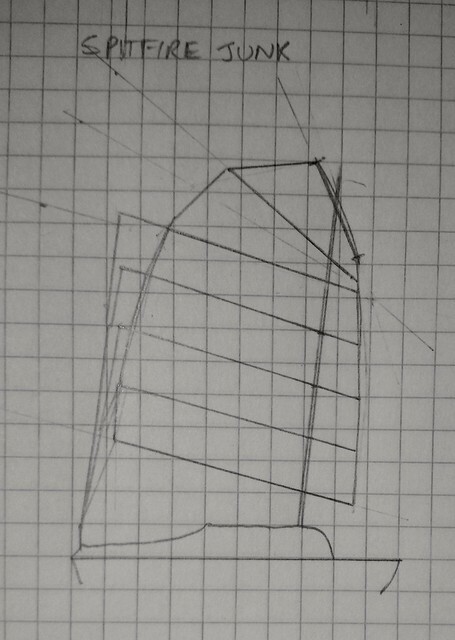 With this in mind I drew this sail plan based on the elliptical Spitfire wing. This plan is based on 4.5m battens, but has a 3.2m second batten and a yard of only 1.9m at a steep angle of 65°. The yard forms the leading edge of the approximately elliptical wingtip. Given Marchaj’s other results showing the critical nature of the leading edge of foils, the yard shape could be quite critical, but fortunately this suggests shaping it in a way similar to that suggested by Hasler and McLeod to provide strength. In this case it would be arched to fill in the ellipse and have a thin top. If this plan works, the centre of lift will be shifted forward considerably, hopefully correcting the Coromandel’s balance problems. I also can’t believe it’s a coincidence that Paul McKay’s Aerojunk looks like a Spitfire wing. 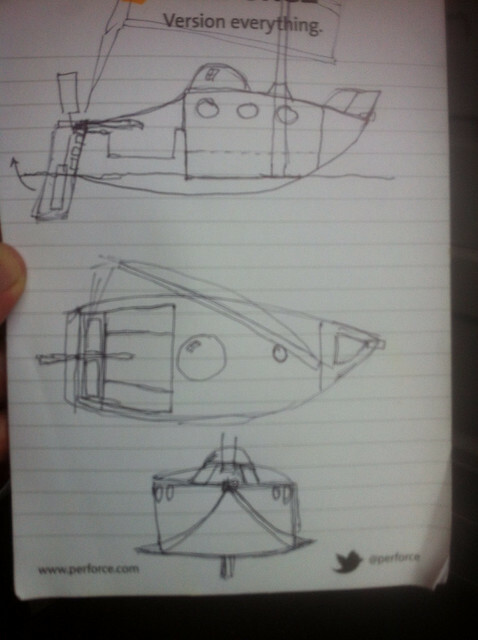 I can now reveal the design of my next boat. If that doesn’t make you smile I’m not sure what to do with you. The thing is, it’s only half a joke. At the Southampton Boat Show I picked up issue 15 of Classic Sailor magazine, mainly because of the retrospective of the Folkboat. Inside I found a review of a wonderful boat, the Fairey Atalanta. It’s a fascinating design by Uffa Fox, resembling a submarine or aircraft fuselage as much as a boat. It has double cast-iron swing keels and is self-righting. It’s steered by a whipstaff, and can plane downwind. I recommend reading about it. Another inspiration of mine is John Riding’s Sea Egg. 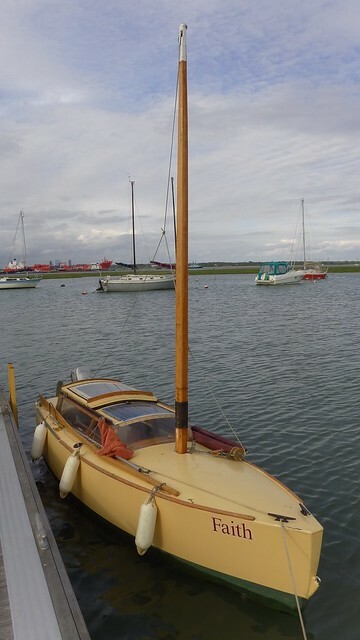 Another fascinating boat design, about which very little is available online. But what’s really got me thinking recently is David Raison’s Magnum Mini, winner of the 2011 Mini Transat. Take a look at this revolutionary hull shape. 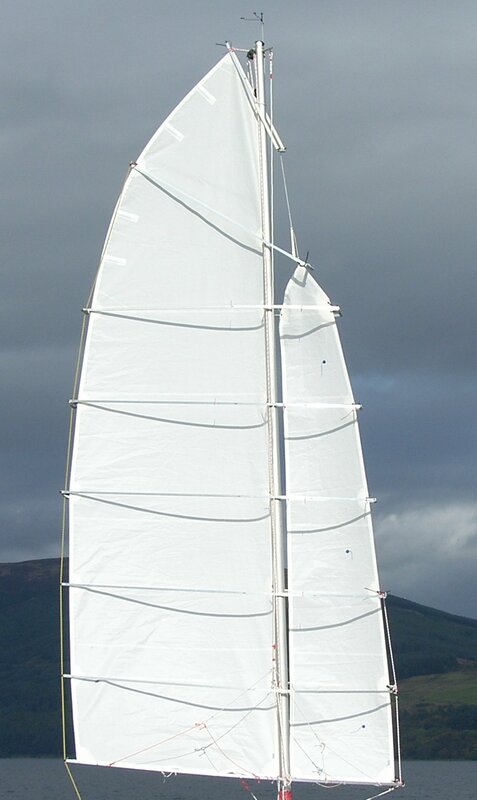 This is a shallow draft scow designed to form an efficient shape when heeled, quite different from the sharp-bowed design of the typical racing yacht. Matt Layden’s Paradox, Elusion, and Enigma are also fascinating designs, especially because of their shoal draft, chine runners, and lugsails. I was lucky enough to have a close look at a Paradox named Faith at Ashlett Creek. And finally, there’s my dad’s favourite, the Thames Barge. Dad led the restoration of a Thames Barge at Pin Mill when he was in his 20s, and he’s very fond of them. He strongly believes in the capabilities of the boxy barge shape and its lee boards. Honorable mentions also go to the Wadder and the Southerly shoal draft cruisers. I have many many sketches of boats, including this one I made (very rapidly) for Annie Hill’s Sib-Lim challenge (very sensibly ignored too). I think perhaps you can see a theme here. Edit: It looks like Yrvind has been thinking along the same lines. He seems to have lee boards and metal sheet ballast (like the Southerly), as I intended in my Sib-Lib sketch above. Time to brush up my Swedish! If you are really observant you might have noticed a new page on the blog in the “about” menu: To Do. I’ve collected together all the to-do notes from my log book and other pieces of paper that I could find. I’m sure I have not found everything. Feel free to ask questions about anything on the list. Many of the items need writing up! 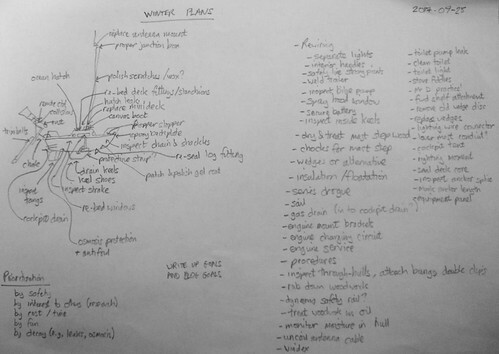 I have little sketches and diagrams for a lot of stuff too.